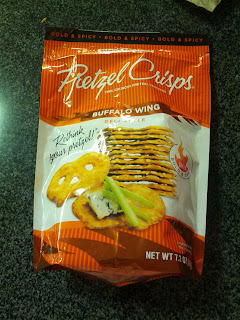 A few years ago, I somehow got my hands on a bag of Pretzel Crisps. They are basically like flattened out pretzels. You get the joy of the crunch of eating something like chips, but they are baked and healthier, and make for excellent vessels for dipping, or topping. The reason I remember these pretzels is because one night, in a random act of snackiness, I made an amazing creation: pretzel crisps, coated with my absolute favorite mustard (Sierra Nevada Pale Ale Mustard, zomg, so good, makes everything amazing), then topped with the pickles and onions from my mom's bread and butter pickle mix. The next night, I amped it up by melting cheese onto them too (Raclette was the best!). Don't judge. It sounds crazy, but it was insanely delicious. But then I forgot about Pretzel Crisps. Until last holiday season, when Whole Foods was sampling the seasonal varieties, the "Holiday Indulgents" line: pretzel thins dipped in chocolate and covered with peppermint candy chunks! The desserty ones were awesome, and reminded me about the whole product line, so I decided to try them out again, particularly as I've been craving snack foods these days. Pretzel Crisps come in a slew of flavors, ranging from simply salted, to chipotle cheddar, and everything in-between (literally, tee-hee, they make an everything flavor!). 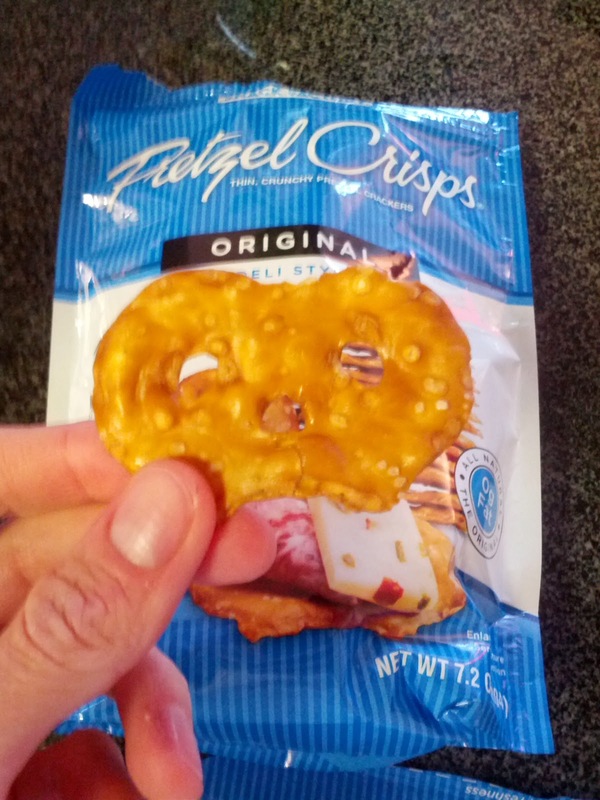 Original, Deli Style Pretzel Crisps. The original version is just simply salted. These were the ones I used to make my magical mustard-pickle-cheese snacks on that first occasion. I've since done this many times. They also a good conduit for just about any topping. When I'm really lazy I just use them with the amazing mustard, but mustard + relish or pickles + melted cheese really is the winning mix! Buffalo Wing, Deli Style Pretzel Crisps. I was very excited to try out this flavor, as it sounded zesty and fun. Unfortunately, the flavor just didn't work. I tried dipping them in a number of things, but they just weren't for me. I still loved the form factor though. Dark Chocolate & Peppermint: These were their classic salty pretzels, coated in high quality dark chocolate, and little bits bit of peppermint. It was a great mix of sweet and salty. NOMS. White Chocolate & Peppermint: Like the dark chocolate, but with white chocolate coating. They were sweeter, and good, but I liked the dark chocolate better. My apartment complex throws a number of parties every year, all with catered food. Sometimes it is amazing, sometimes very lackluster. Our last winter solstice party was a big disappointment, catered by J. Jardine, and wasn't good at all. It was a huge letdown, because the prior year's event was amazing (I wish I knew who had catered that one). Then we had an Oscar's viewing party catered by Delessio, that was good. Not amazing, but solid. 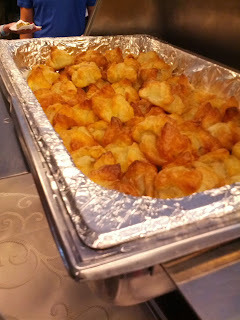 And more recently we had a decent brunch catered by La Boulange. So I had no idea what to expect this time around. 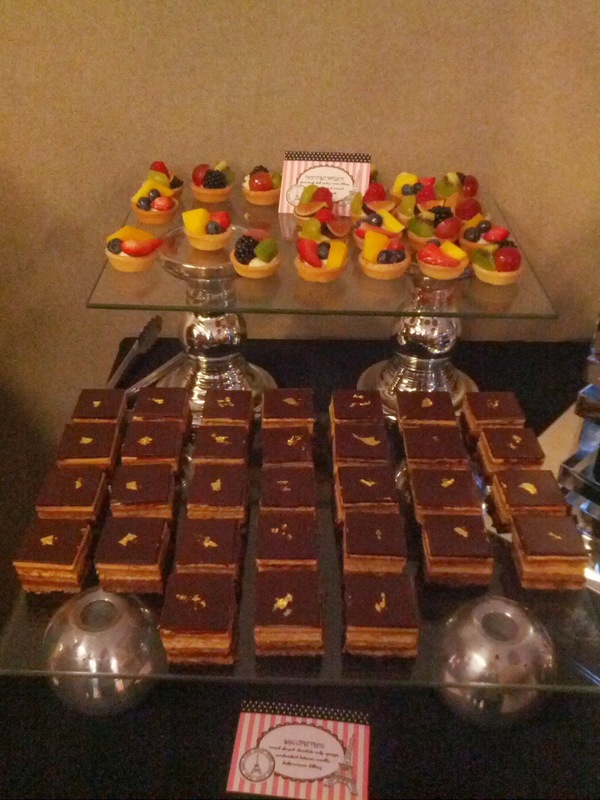 The catering this year was by Peninsula Catering. Sadly, it went the way of the winter solstice party ... nothing was good. It was also really pricy. I would not recommend this caterer. Scorpion Prawns. $5.95 for 2. "Fisherman’s Daughter’s Prawns, a sustainable prawns option, butterflied and roasted, filled with artichoke, crab, cheese, breadcrumbs and a hint of chipotle." These were not good. Even though served in a chafing dish, they were cold. 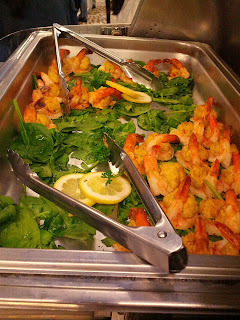 The shrimp was rubbery. The filling was somehow entirely flavorless, even though it was apparently made of artichoke, crab, cheese, breadcrumbs, and even chipotle. The filling was basically a solid cold mass in the middle. Least favorite of the appetizers. Potato Blinis. $4.95 for 2. 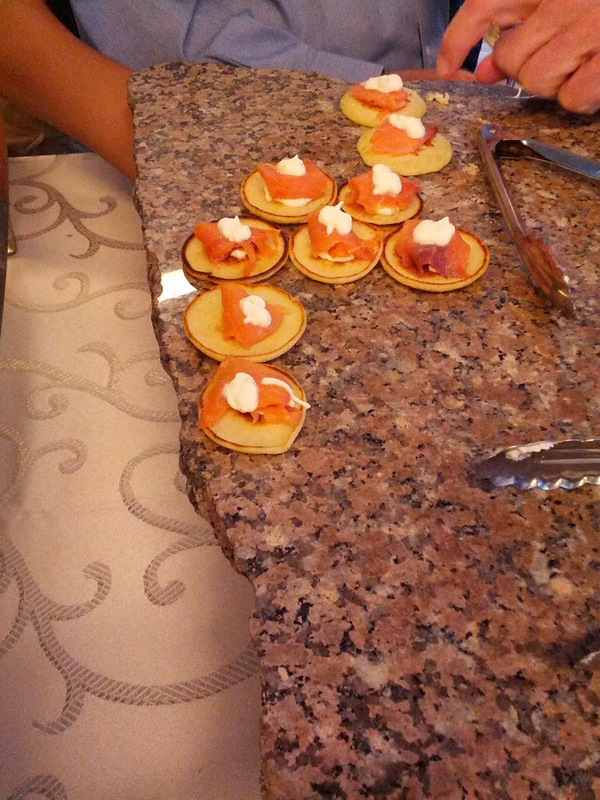 "Petit blinis (1.5”), topped with crème fraîche and cured salmon." These were mostly just unremarkable. The potato blini was a bit chewy and also cold, but this time intentionally. The salmon wasn't bad, but also wasn't very flavorful. No nice smokey flavor, but at least it wasn't stringy or fishy, not offensive. Tiny dot of crème fraîche was too small to taste. Sadly, my favorite of the apps. Petit Beef Wellingtons. $4.95 for 2. 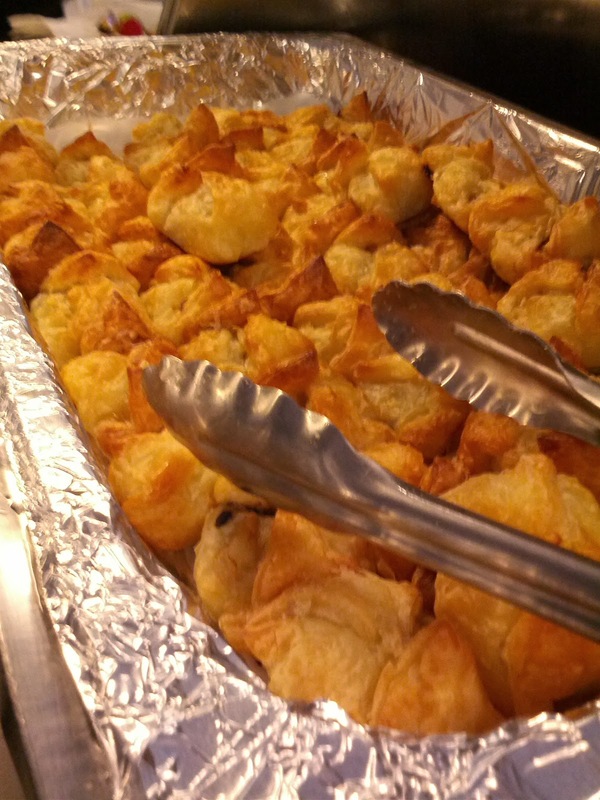 "Delicate filet mignon cuts coated in pâté and duxelles, wrapped in puff pastry." This was the appetizer I was most excited for, since I recalled a previous event where we had remarkable filet. It clearly was a different caterer. These were kinda awful, and I got a totally "fresh" batch. The puff pastry was soggy. Limp and wet. The filet inside was way overcooked, certainly not "delicate" as described. I didn't find any pâté nor duxelles in mine. Serious disappointment. Not quite as bad as the prawns, but a runner up for second worst. 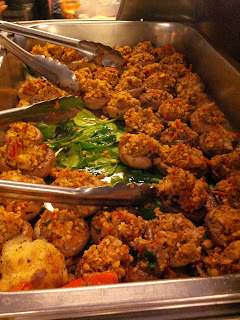 French Stuffed Mushrooms. $3.95 for 2. "Stuffed with fennel, sun-dried tomatoes, garlic, basil, Camembert & parmesan." I didn't really expect to like these, but I tried them anyway. Camembert and sun-dried tomatoes could be good, right? Wrong. The mushrooms were super slimy, and not fully cooked. I didn't taste sun-dried tomatoes, nor Camembert. And again, cold. Really off-putting. Tied with the petit beef wellingtons for second worst. Pear and Brie Pouches. $4.25 for 2. "With almonds, in phyllo pouches. " 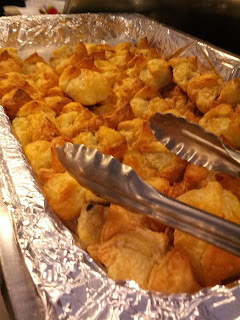 After the fail with the wellingtons, I'm not even sure why I tried yet another puff pastry dish. I guess because like brie! These were unremarkable. The pastry wasn't as bad as the wellingtons, but it certainly wasn't crispy. I didn't find any pears nor almonds in mine, but a touch of cheese was present. Not offensive, but nothing redeeming. Second favorite, but only because everything else was sooo bad. House Cheese Tray, $75: "Provolone cheese, smoked gouda, sliced brie log, and herb-crusted goat cheese, served with stuffed Spanish olives and gluten-free crackers". This was the most uninspired cheese tray I've seen. It seriously could have come from Walmart. I tried the gouda only, and it had no smoky flavor at all. Meh. Crudite Batonettes, $4.95 per pair: "Seasonal vegetable batonettes with roasted chipotle hummus on compostable bamboo cones". The veggies looked so dried out and limp that I didn't bother try these. Bruschetta, $85 platter: "Make your own bruschetta, with chopped roasted tomatoes with garlic, olive tapenade, marinated artichokes, roasted red peppers, chopped portabella mushrooms & gluten-free crackers". The crackers were actually tasty, but were just store-bought. The olive tapanade was too strongly flavored, not balanced. Assorted Pizzeta, $3.50 each: Mini pizzas, cheese, pepperoni. The cheese looked congealed, the crust rubbery. Mini Quiche, $3.95 each: I don't like quiche in the first place, so I certainly didn't try this. Mini Quesadillas, $4 each: Chicken, beef, or veggie, with guac, sour cream, pico de gallo. Again, at this point, I was so down on their food that I didn't bother with these, as they aren't the sort of thing I'd normally like that much anyway. Fresh Fruit Tartlettes, Opera Squares. $42 for 24. Ok, on to desserts, normally a highlight for me. Would Peninsula Catering redeem themselves? Almost. I started with the Fresh Fruit Tartlettes: "Short dough shell, pastry cream filling and colorful assortment of seasonal glazed fruit (mango, kiwi, strawberry, raspberry, blueberry)". The tart shell was stale and a bit soggy. No flavor, no butteryness, nothing to it. The pastry cream filling was ok. The fruit, cute, nice presentation, but unremarkable. Not offensive, but not good. Least favorite dessert. Opera Squares: "White cake soaked in coffee syrup, filled with coffee butter cream and dark chocolate mousse, finished in dark chocolate ganache, garnished with a touch of gold leaf." These were actually good. The cake was moist from the coffee syrup. The butter cream was creamy, as was the mousse. Lots of flavors and textures here. The ganache was nicely chocolatey. By far the tastiest thing all night. Assorted Macarons. $3.75 for 2. 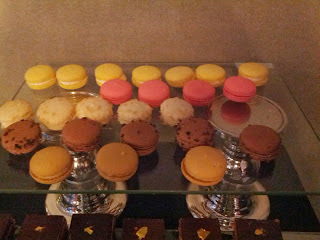 I only tried a coconut macaron, as the rest were all gone when I looped back by the table. It was ok. The cookie part had a decent lightness to it, the filling creamy. Shredded coconut on top. I never love macarons, but these weren't bad. 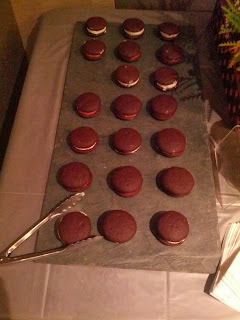 I didn't try one, but they had an assortment of whoopie pies, filled with either chocolate or vanilla cream. Ojan had one and seemed to enjoy it. Two varieties of cake pop: chocolate cake with chocolate coating, or vanilla cake with white chocolate coating. I went for the vanilla/white, since I was trying not to have too much caffeine. The cake inside was incredibly dry. No flavor whatsoever, certainly not vanilla. 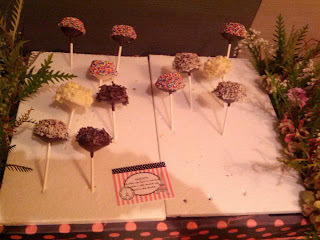 The layer of white chocolate on the outside was very thick, waxy, not all that sweet. And then white chocolate shavings around that. The shavings added some texture, but overall, this was not very good.